A 1:12 scale coiled rag basket filled with knitting supplies is ready to be placed in a dolls house scene. Photo ©2008 Lesley Shepherd, Licensed to About.com Inc. This dolls house scale coiled rag basket is made from fabric wrapped wire. The technique is the same as one used for simple full sized baskets, although those are normally made by wrapping the fabric around cord or rope. This type of coiled basket adds a country look to a dolls house scene. The baskets can be made from narrow wired ribbon twisted into a coil, or narrow ribbon wrapped over wire, or scale pattern fabrics wrapped over wire. The size of the basket depends on the thickness and length of the fabric wrapped coil. In full size, the fabric is usually wrapped over rope, or cord. To make these miniature baskets easier to make, the fabric has been wrapped over wire. Once you become used to the technique you can wrap the fabric over crochet cord or embroidery thread instead of wire if you prefer. The baskets are good for sewing baskets, fruit baskets, pet beds, or lots of other uses. Coiled baskets are easy to form into shapes. Your basket can be round, flared, or have straight sides, depending on how you place your coils. If you prefer, you can make a simple woven fruit basket from thread and wire to learn how to weave with a traditional frame. A similar method of coiled weaving is used to make a miniature moses basket using raffia. Materials for a miniature dolls house scale rag basket include fabric, glue, fine wire and thread. 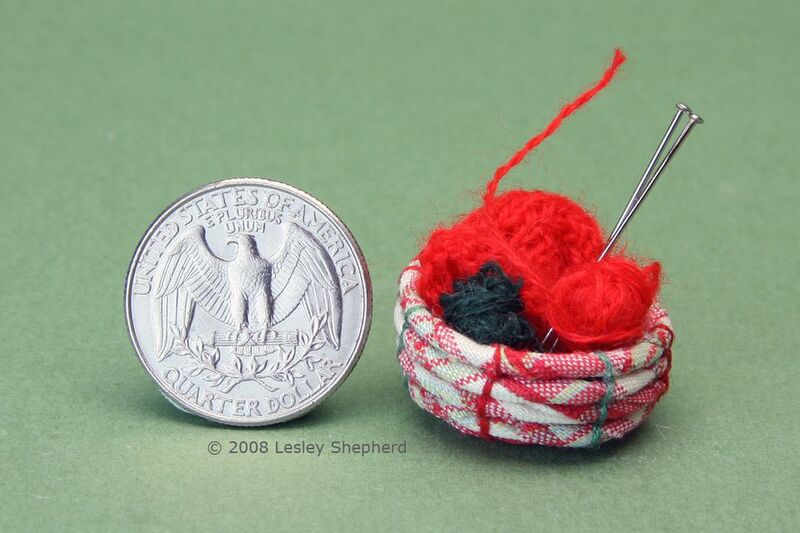 Photo ©2008 Lesley Shepherd, Licensed to About.com Inc.
Miniature Scale Fabric - the basket shown required a 3/8 inch wide strip of fabric 24 inches long. You can also use narrow wired ribbon (without a wire core), or narrow ribbon wrapped around wire. If you choose regular fabric, try to use a selvage edge if possible. Fiber Wrapped Wire - the basket shown was made with a single 18 inch piece of lightweight, thread wrapped wire. Use the finest thread wrapped wire you can find to make a small fabric coil. The thread wrapping helps glue adhere to the wire. Embroidery Thread - For your first project choose two coordinating colors to make the project easier to work. Four, 12 inch, 2 stranded lengths of each of two colors were used for this project. Pressing Iron - needed if you have to turn over an unfinished fabric edge. The end of the fabric is folded over the wire, glue is applied to the fabric, and the wire is turned to coat it evenly with fabric for a dolls house scale rag basket. Photo ©2008 Lesley Shepherd, Licensed to About.com Inc. The first step in making miniature rag basket is to wrap fabric around a wire core. If you are using regular fabric, without a selvage edge, begin by cutting a 1/2 inch wide strip of fabric, two feet long. Keep the cut close to the grain of the fabric. Turn under a 1/8 inch edge and press it in place with the iron. The turned edge is not necessary if the fabric is cut with one selvage edge. The finished edge will cover the raw edge as you wrap the wire. When the edge has been turned under, trim the fabric strip so that it is approximately 1/4 of an inch wide. If you will be using a narrow ribbon, you do not need to turn under an edge. If you are using wired ribbon, you won't need to wrap the ribbon around a wire core, in this case, you only need to twist the ribbon tight together to form a tight bendable string. With the folded edge up, lay the wire on top of the fabric strip as shown in the photo. Put a bit of glue on the fabric (the side with the fold showing) and turn the end over the tip of the wire as shown above. Spread a thin layer of glue on the first four inches of the fabric strip, and begin to turn the wire, rolling the fabric tightly over the wire as you turn it, the same way you would wrap a wire with florist's tape. Make sure the folded fabric edge covers the raw edges as the fabric goes down the wire. Continue until the wire is tightly wrapped with fabric. Glue the end of the fabric to the end of the wire. If you want to make these baskets in full size, two inch fabric strips are wrapped around a core of rope or twine to create the fabric rope used as the basket base. Embroidery threads are attached to the start, and the first coil area of a dolls house miniature rag basket. Photo ©2008 Lesley Shepherd, Licensed to About.com Inc.
Take one of the four similar colored sections of embroidery thread (two strands) and fold it in half over the end of the fabric wrapped wire. Tie it tightly in place close to the end of the wire so both ends are equal lengths. (I used a reef knot). Tie the other three sections of embroidery thread along the fabric wrapped wire, with the next thread spaced 3/8 of an inch from the first, and the third and fourth threads spaced 1/4 of an inch apart, as shown in the photo. The spacing will be first thread, 3/8 inch, 2nd thread, 1/4 inch, third thread, 1/4 inch, 4th thread. These sections of thread will be used while you coil the first three coils of the basket. In this method of miniature coil basket weaving, embroidery or crochet thread is used to tie the basket together. Other methods use stitches to join the coiled layers. If you want to make these baskets in full size, the traditional method of tying is to use matching or contrasting strips of fabric instead of thread. The start of the coiled base of a rag basket. The first thread is tied to the wire where it meets the coil. Photo ©2008 Lesley Shepherd, Licensed to About.com Inc.
Take the end of your fabric wrapped wire, and use tweezers or your fingers to make a tight circle. Whenever the new coil meets up against a thread, tie the thread around the wire, with a tight knot centered on the fabric wrapped wire. As you coil the wire around the center and build the base out larger, the lines of knots will form a decorative line on the basket. Tip: Make sure the coil is wrapped and tied to make it as tight together as possible with no gaps. As you get further away from the center it will become easier to work. As each coil of wire touches a tying thread, it is tied tightly to the coil before it. Photo ©2008 Lesley Shepherd, Licensed to About.com Inc.
Set your first knots on the outside edge of the coil keeping the first knots in a line at 12 o'clock, 3 o'clock, 6 o'clock and 9 o'clock from the basket center. Once you have the first knots in the right place they will keep on going in straight lines. Make sure the coils of the basket base are flat and close together. The base will flex, but it shouldn't wobble loosely. With the first three coils secured, an extra set of ties is added between the four main ties to secure the larger coils of the miniature rag basket. Photo ©2008 Lesley Shepherd, Licensed to About.com Inc. When you have made three wraps of fabric coil around the center of the base, add your second color of thread ties onto the coil at a point between each pair of the starting tie threads. (See Photo) For your first basket it is easier to see these second threads if they are a different color. On this basket I have used red for the first four threads, which are tied out in lines on quarter segments of the basket base, then added in green thread as the second color, which makes lines in between the red lines as the basket grows larger. Tie these second threads in place around the fabric wrapped wire the same way you did the first threads, so that the two ends of each double strand of thread are equal lengths. You will have a red thread, then a green one, then a red one, then a green one and so on. Continue to coil the basket base, attaching the coils with a tight knot each time they meet a line of thread. This basket has a base just under an inch across. The rag coils are placed on top of the layer below to form the sides of the miniature rag basket. Photo ©2008 Lesley Shepherd, Licensed to About.com Inc.
Start forming the sides of the rag basket by laying the coil on top of the previous coil at the next knot point after your base is the size you want it. For baskets with straight sides, lay the coil right on top of the coil below it, for gently sloping sides, adjust the coil so that it is partially on top of the previous coil and tie it in place. The knots should be shifted so that they occur on top of the side coils, keeping straight thread lines on the outside and inside of the basket where they will be seen. Make sure you keep your coils close together and tightly tied in place. Keep the knots stacked on top of each other to keep the line pattern straight as a detail on the sides of the basket. Tie off the threads at the top of the dolls house scale miniature rag basket and glue them under the top coil. Photo ©2008 Lesley Shepherd, Licensed to About.com Inc. When you reach the end of your rag basket, Tie off the stitching threads and hide the cut edges beneath the top basket coil. To do this, make the final knot at the top of each thread on the inside of the basket. Make sure the knot is tight. To hide the knot ends Lift up the fabric wrapped coil and place a tiny dab of glue on the threads under the coil where it won't be seen. Pull the ends of the thread out from the center of the basket where you tied the last knot, anchoring the thread in the glue as it passes under the top coil. Cut the thread just under the coil and check that the ends don't show on the outside or inside of the coil. Tie off each set of ends as you reach the next thread. To finish the coiled rag basket, trim the end of the fabric on the coil to a point, tie it in place inside the previous coil, and glue the pointed end in between coils on the inside of the basket. Photo ©2008 Lesley Shepherd, Licensed to About.com Inc.
To finish the top of your miniature coiled rag basket, tie off the last thread ends as outlined in the previous step. Trim the wire and fabric coil so that the fabric end is slightly pointed. Bend the end down inside the basket, laying the trimmed fabric in between the next two coil layers and glue it in place where the ends will not be seen. Your coil basket is finished. If you wish, you can use the same technique to make fitted tops for a basket. To make baskets with handles, leave a tying thread on either side of the basket but tie the rest off. Tie the coil in place at the last set of threads, then take the coil across the top over the basket to the other side where you left the loose tie, and tie the coil in place as a handle. Finish the basket by tying in the end of the coil as outlined above. Try different fabrics and contrasting threads to make a variety of colored baskets. To make more natural looking baskets you can use the same technique, using raffia to wrap the wire, and using narrow strips of raffia or natural linen thread for the ties.